While the law in most jurisdictions has one become an adult upon turning 18, the road to adulthood in everyday life is a lot more winding. Young women often mature earlier than men and seem to crave maturity beyond their years. 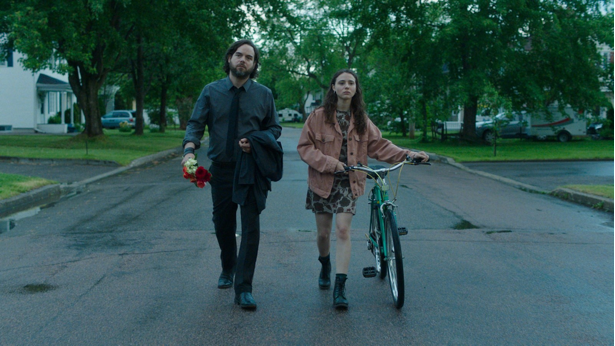 I’ve seen this reflected in several cinematic works over the last decade including Jason Reitman’s Juno and 2017’s underrated festival sleeper Columbus, both of which feature women in their late teens bonding with men in their thirties. This theme is continued, but not quite with the outcome you may expect in Sébastien Pilote’s The Fireflies are Gone. The film proceeds to unpack baggage regarding her absentee father Sylvain (Luc Picard) who fled town after his attempt to unionize workers at a local mill resulted in it’s abrupt closure. There’s more to that story as Sylvain’s polar opposite Paul will later reveal, but the event has left the town utterly devoid of anyone other than “kids and old people” as Léo complains to Steve. While you may initially expect the film to develop these two as an item, the story is far more interested in examining Léo’s relationship with all three men in her life and how no single one truly defines her. The film inhabits territory often occupied by handheld-camera heavy mumblecore indies, but behaves more like a Douglas Sirk melodrama, with it’s bold colours (Léo seems fond of red and yellow), thoughtful camera work, and welcome orchestral flourishes in it’s score. The story subverts expectations by providing an introspective slice of life that feels cut from a much larger whole rather than a manufactured life crisis thrust into a three act structure. I’ll admit this could potentially be a turn-off for some, but the film punctuates the proceedings with a dose of fun and a visually strong ending that it’s nearly possible to leave the theatre unsatisfied. Like many Léo craves far more than her circumstances offer and as acted in a winning turn by Karelle Tremblay leaves you craving a sequel for her continuing journey. She is ably supported by co-stars Luc Brillant and Picard, the latter of which visibly carries a burden which will resonate with anyone whose life has past them by. It was after examining all my pieces for Hollywood North Magazine, I realized that I had to yet to review a single French-Language film. Quite an oversight considering how much of our national cinema is generated from the single province of Quebec. The Fireflies Are Gone is an excellent place to start on that journey as it presents it’s audience with a thought-provoking slice of life that will hit home regardless of which of Canada’a languages you speak.